Download free music for your videos. Students turn analog work digitally. Content curation and sharing are fast becoming skills in our social media world. You are what you post. Teaching students how to share is an important component of modern citizenship [also known as digital citizenship]. Flipboard can be used as a basic RSS reader that allows you to keep track of updates to your favorite websites. Teachers can organize web content into a board that they share with the class. This is a great way to give students their web reading material. 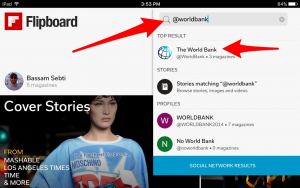 Teachers invite students to add content to the Flipboard. Students then become a part of the learning process and this can be used as formative assessment. When students become a part of the process of online content curation, it will lead to discussions about what should be shared online and what we share portrays us. Imagine students at different schools collaborating on a project together using Flipboard as the centerpiece. As TW did for his COETAIL Course 5 Final Project, students at different schools collaborated on content curation, reflection writing about what they read, and commented on each others’ blogs. This allowed students with different perspectives on the same topic to learn from each other. Take a look at TW’s Course 5 video that explains how he used Flipboard. Recognizing there was a movement to use Flipboard in the classroom, the company started Flipboard Edu and has a #FlibboardEDU hashtag on Twitter. Both are excellent resources for articles related to education. Often the bottleneck in many assignments that involve video production is the choice of an audio track. Students can spend hours looking for the right song on the Internet, only to find out that they cannot use it because of copyright issues. This resource tackles both problems at once and makes available for download free music for your projects with clearly labeled Creative Commons licenses. YouTube has a formidable built-in library of songs that are perfect for any video projects. You can filter songs by genre, mood, instrument and duration. Popularity is displayed as a thermometer bar for each song and most importantly, a download arrow is the only thing you need to click on to get this file onto your computer. Jim Sill who shared this tip with us, also pointed out that most songs feature a few seconds of build up which constitutes a perfect intro for your movies. Click on the 3 hot dogs by the side of the top-left YouTube icon to display the left sidebar if it’s hidden. Click on Video Manager above the cover picture of your channel. Click on Create and the Audio Library will be displayed. 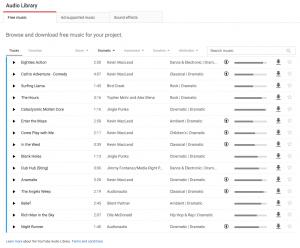 Some of the songs featured in the Audio Library have Creative Commons license. Creative Commons copyright licenses give everyone from individual creators to large companies and institutions a simple, standardized way to grant copyright permissions to their creative work. For students, they give a clear path to understand the conditions under which they can remix a piece of work into their own project. The license you will find the Audio Library is of the type Attribution (CC BY). This license lets others distribute, remix, tweak, and build upon your work, even commercially, as long as they credit you for the original creation. This is the most accommodating of licenses offered. Matt Jurgens takes the tip of the hat this week. Matt’s students use whiteboards around the classroom to work on math problems. To collect digital evidence of these pieces of “analog” work, Matt has a very ingenious way: students use their phones to take photos which they then upload to Google Classroom. Voila! A simple trick very well executed.